The Campochiarenti estate dates back to the end of the 10th century as the estate church, Saint Nicholas, was built then. This church was mentioned in an official document with the Pope signature, a so-called bulla pontificalis, already in the 11th century. The importance of the Campochiarenti estate and its church increased during the coming centuries, however, being located in between San Gimignano and Poggibonsi it was affected by the fights between Guelphs and Ghibellines. During the 14th and 15th centuries, San Gimignano entered a period of problems and decline with the occurrence of the black plague and famine. This forced San Gimignano to turn itself over to Florence being dependent on their financial aid and thus having to hand over their political autonomy as well. The area of San Gimignano has had a turbulent history, also being bombarded much further on during World War II. It is in the middle of this interesting past, that the Campochiarenti estate is located. Today, it is the family of Daniele Rosti who is the owner, and Daniele runs the winery together with his brother Emanuele. Chianti & Chianti Classico…what’s the difference? Campochiarenti is situated just east of San Gimignano in the Chianti Colli Senesi district, i.e. very close to Siena, which is the district facing the Chianti Classico district. The Chianti and the Chianti Classico are two very different wine denominations and areas in Tuscany. Chianti Classico is well-known for its by now classical trademark, namely the Black Rooster. 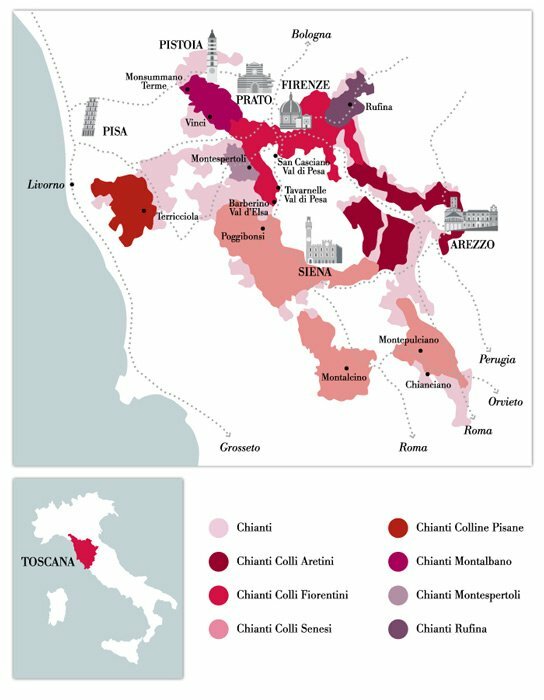 The Chianti district that we will focus on here, is divided into 7 different sub-zones: Colli Aretini, Colli Fiorentini, Colli Senesi, Colline Pisane, Montalbano, Rufina, and Montespertoli. The Consorzio Vino Chianti was founded in 1927 and has since then been safeguarding and regulating the processes for the production of Vino Chianti. One of the noteworthy differences between Chianti and Chianti Classico wines is that Chianti Classico wines since 1996 no longer can contain white grapes, but instead up to 15% of red international grapes. The Chianti wines can still be produced with the addition of white grapes up to a limit of 10%. The only exception here is Chianti Colli Senesi, where after 2015 white grapes such as Trebbiano and Malvasia no longer can be used. According to the regulation, Chianti Colli Senesi needs to be produced with at least 75% Sangiovese grapes. 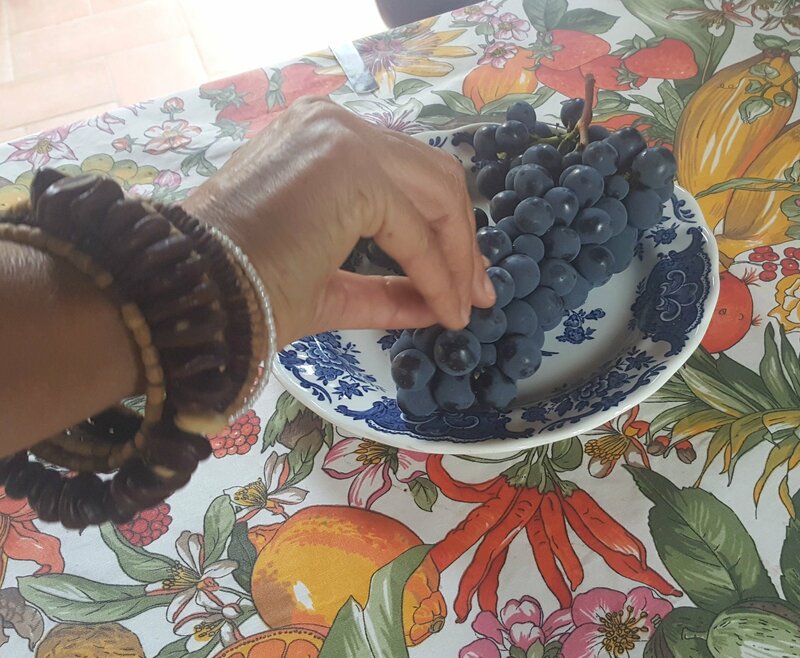 Other native grapes to the area such as Colorino, Canaiolo Nero, and Ciliegiolo can be used for the remaining 25%. Furthermore, international grapes can be used up to a limit of 10%. The entire estate comprises 123 acres though only about 34 acres are vineyards. It is, as I mentioned above, situated in the middle of the Chianti Colli Senesi district, but still, on the other side of the hill facing the estate vineyards lies the Chianti Classico area and its sub-zone Castellina in Chianti. The peculiar thing, that Daniele told us about here, is that the soil in his vineyards consists of clay and fossil shells as this part more than 3 million years ago was the bottom of the sea. On the other side of the hill, in the Chianti Classico area, it is mountain landscape and thus the soil is completely different. They both cultivate Sangiovese, but with very different results. The work in the vineyard is important, as good and healthy grapes are essential in order to be able to produce high-quality wines. Daniele has told me that they are a traditional winery with an integrated approach, i.e. that they want to minimize the pollution as far as possible. This means that they are trying to follow the course of nature itself. They are not organically certified and have no interest in gaining such a certification as they believe it to be too much bureaucracy and they prefer to stay true to the natural and healthy farming procedures in the vineyards. However, they have an Eco Promo Wine certification. This means that they were one of 100 wineries from all over Europe who joined a project to study the impact of CO2 on the production of a bottle of wine. The result of this study was that the key factor contributing to the production of CO2 is the bottle and the weight of the bottle. This is why at Campochiarenti they use the Bourdeaux bottle which is considered to be the lightest one. The choice of the bottle does not have any impact on the taste, according to Daniele, only the choice of bottle size can impact the taste of the wine during aging. Returning to talk about the vineyards, they do not use any pesticides, herbicides, or other chemical substances on the soil since 25 years. Therefore, they have a healthy soil which works in favour of healthy grapes and a quality end result. They do need to treat the grapes against diseases at times and try as far as possible to use only organic substances. The main grape varieties are, of course, Sangiovese and Vernaccia, but they also cultivate Colorino, Canaiolo, Ciliegiolo, Mammolo, and Foglia Tonda, which are all indigenous grapes to Tuscany. They also cultivate a selection of other grapes in lesser quantities, both international and Italian varieties, such as Ancellotta, Cabernet Sauvignon, Cabernet Franc, Malvasia, Malvasia Nera, Merlot, Montepulciano d’Abruzzo, Rebo, Trebbiano Toscano, Pinot Bianco, Pinot Grigio, and Pinot Nero. At Campochiarenti, they want to produce typical wines, i.e. wines that reflect the area and the denomination. They are cultivating a blend of 20 different Sangiovese clones that are different in concentration and in maturation time, in order to gain the best results during every harvest. As a small winery, they are happy to have different clones of the Sangiovese at hand as different clones can give different results, different temperature, different maturation time, which means that every vintage is different. This makes it possible for you to really taste the terroir and the work that is carried out every year in the wine bottle. This wine can then evolve, of course, and last for years during aging. Daniele is of the belief that a good Chianti can last for several decades. In general, the Campochiarenti winery only releases their Chianti wines on the market after 2 years, which means that they give it the time it needs in the barrel and in the bottle to have a fairly smooth and balanced Sangiovese wine at hand. We are now finally coming to the wines produced by the Campochiarenti winery. They produce Vernaccia di San Gimignano DOCG, Dorato IGT Toscana, Chianti Colli Senesi DOCG, Chianti Colli Senesi Riserva DOCG, Vivi IGT Toscana Rosso, and Vin Santo del Chianti. The Vivi IGT Toscana Rosso is a very dear wine to Daniele and his brother Emanuele, as they have named it after their mother. It is a Super Tuscan style wine, with a blend of 50% Sangiovese, 35% Merlot, and 15% Cabernet Sauvignon. It was awarded in New York in 2012, for its excellence. The Vin Santo del Chianti they produce is just fantastic. We tasted a bottle from 2003 which had notes of almonds, dry apricots, dry melon, a bit acid-like honey, and it was very mineral. Below, I will talk more in-depth about a couple of the wines. The Vernaccia di San Gimignano is a white wine with a long history that can be dated back to the 12th century, though its first mention in a document seems to have been in 1276 in the Ordinamento della Gabella in the San Gimignano municipality. Already in that period, the Vernaccia wine was a profitable commerce. It was a wine treasured by kings, popes, as well as the rich merchants, and it has been mentioned in literature by famous authors and poets such as Cecco Angiolieri, Dante, Boccaccio, Franco Sacchetti, Deschamps, and Chaucer. Furthermore, it was the favorite wine of well-known families such as the Medici, Rucellai, and Guicciardini Strozzi. The name Vernaccia is believed to stem from the word Vernazza, which means embarcation or loading area. Vernaccia SG 2014, 2011, and 2009. Vin Santo 2003. The Vernaccia was the first white wine to be awarded the DOC denomination in Italy in 1966. 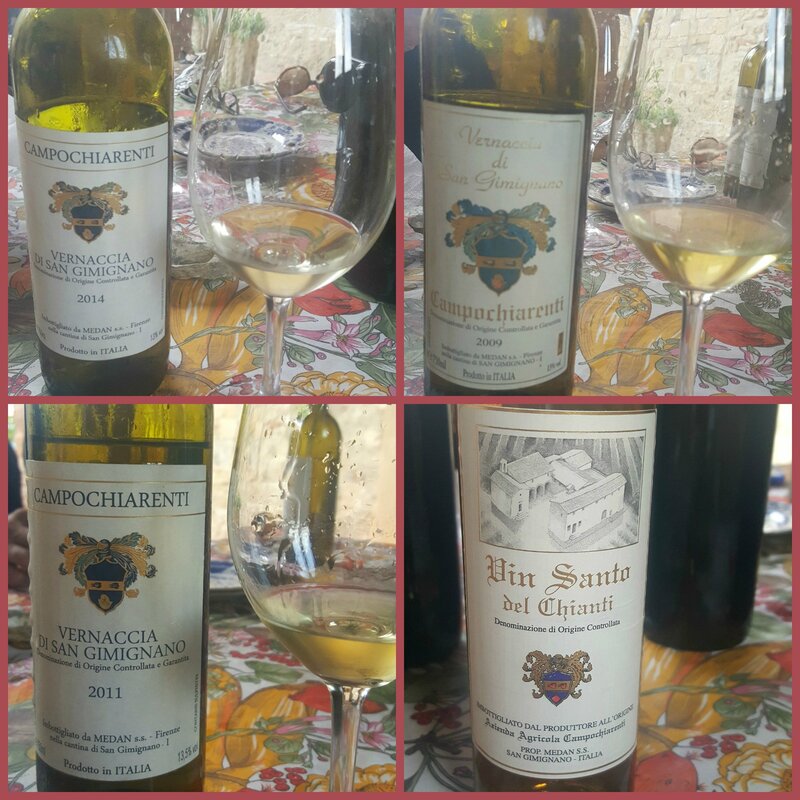 It was only in 1972 that the Consortium of the Vernaccia was founded, and later on, it changed the name to Consorzio della Denominazione San Gimignano. In 1993, it then also gained the DOCG denomination. According to the regulation, the Vernaccia di San Gimignano DOCG should contain a minimum of 85% of Vernaccia grapes and max 15% of other, non-aromatic, white grapes cultivated in Tuscany. It can contain a max of 10% of the grape varieties Sauvignon and Riesling. The Riserva should be aged at least 11 months in oak barrels or steel vats, and at least 3 months in bottle. At Campochiarenti, the Vernaccia vines are around 25-30 years old and the grapes are always hand-picked. The grapes are soft pressed in the winery into a juice that then undergoes a slow fermentation process at a low temperature. The Vernaccia has a very good aging potential even though the wine is often released to the market as fast as possible in order to be profitable. 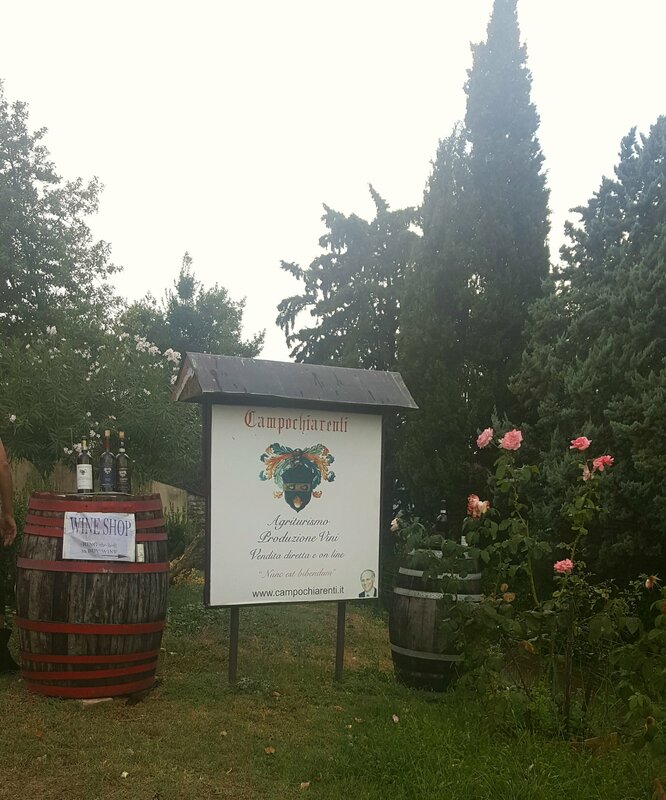 At Campochiarenti they try to age their Vernaccia wine a bit longer and only commercialize it after one year. They do not produce any Riserva as they do not want to age the wine in oak, rather they only use steel vats in order to better enhance the flavors and the characteristics of the terroir. They want to have the notes of ripe, dry fruit and the smoked notes that come with the aging. We noted these changes when tasting the three vintages 2014, 2011, and 2009 when we were there. At the palate, we also felt the hints of minerality and saltiness. This is a very interesting, enjoyable, and very good wine that you can pair with a wide range of dishes, such as cold cuts, fish, white meat, or even Asian or fusion food. So earlier, I mentioned that Chianti Colli Senesi needs to consist of at least 85% Sangiovese and for the rest, 15% of red grapes cultivated in Tuscany.